A concert of the Vegetable Orchestra appeals to all the senses. As an encore at the end of the concert and the video performance, the audience is offered fresh vegetable soup. In artistic, aesthetic and infrastructural decisions of importance all members of the orchestra have their equal vote. The ensemble is a mix of people with different artistic backgrounds - musicians, visual artists, architects, designers, media artists, writers and sound poets all come together here. The further exploration and refinement of performable vegetable music is a central part of the orchestra's aesthetic quest. 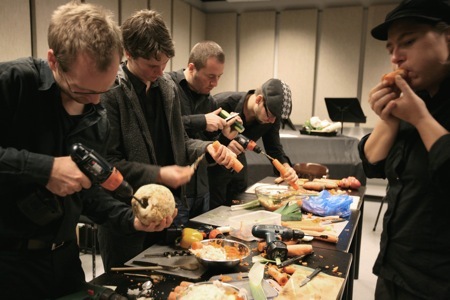 Every individual background that is brought into the project is of vital importance in sustaining the fundamental artistic objective of the Vegetable Orchestra.The broad variety of creative approaches at the same time secures the artistic autonomy of this unique ensemble.